We strive to make ourselves available through many media outlets so that it is easier for you to get your questions answered. So no matter what your preferred method may be, please contact us with any questions about our services or just to say hi. You can find a variety of social networks in which we are active in the header of this page or try the Contact Us form in the sidebar. 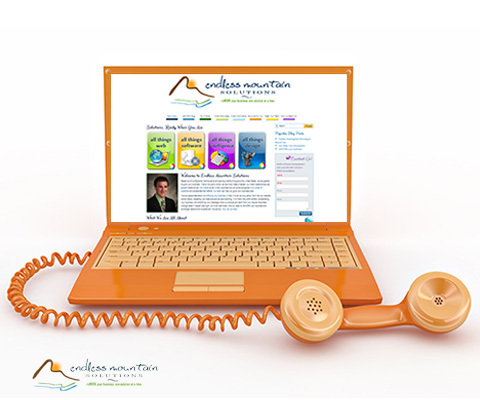 If social networks are not your thing and you prefer a voice-to-voice conversation, give us a call at 570-250-1170. If you don't like virtual socializing, phones, or forms - then just shoot us an email at info@endlessmountainsolutions.com. No matter how you choose to contact us, we'll be sure to respond to your inquiry quickly to get you the answer you need. If you would like to contact one of our team members directly, there is contact info for each of us on the Team page. We'd love to hear from you!